This past Friday, I attended the Nashville Home Show and met HGTV's John Gidding. We actually had a special blogger/media event with John. Did you know he graduated from Harvard with an architecture degree? Wow! He had lots to share about adding curb appeal to our homes. 1. The Front Path - Is that path easily accessible from the driveway or street? If not, make changes so that your guest have an obvious, welcoming path to your front door. Consider adding pavers like these! A few of these stone looking pavers are inexpensive yet create an obvious path to the front door where no sidewalk exists. 2. 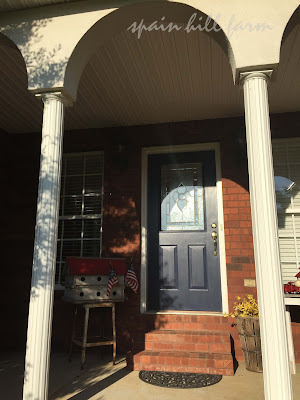 The Front Door - Can the front door use a fresh coat of paint or even a color change? Some colors are traditional to certain styles of houses so the color choice may be fine. See if it needs freshening up. If you want to change the color, choose a color that fits with the style but also adds a pop of color to the front facade. I have used and recommend Modern Master's Front Door paint. I painted the front door of our former home with their Elegent (Navy Blue). Loved it! 3. The Mailbox - Is your mailbox sad, beat-up, or just plain boring? Add a little pizzazz. Here you can get a little expressive! Love this bronze one from Amazon. Even just adding your house numbers in an exciting, eye-catching color helps. Which brings me to the fourth item. 4. The House Numbers - Here is another area you can express yourself. 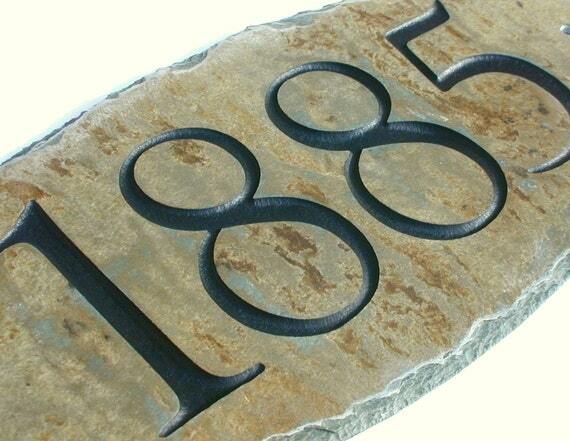 John said adding nice looking numbers to the front of your home gives your guests an idea about you. Do you have the sad reflective stick on numbers? I confess, my mailbox is the only place we have our house number and, YES, they are those 96 cents reflective stick ons. I've added it to my list to change ASAP. Many online sites have inexpensive numbers in a variety of styles. Why not choose a fun one?! I'm considering something like this from Etsy. 5. The Not So Perfect Items - Are there things that need fixing up? Is there an item that's broken or just doesn't belong? Those are the last items John considers when adding curb appeal to a home. See, it doesn't take a lot of money to make your home more appealing. These are great tips if you're considering selling your home. If you are, just make sure your choice of door color as well as the mailbox adornment would be pleasing to most everyone. Hope you learned something. I sure did! John was very nice and generous to share his tips with us. Farmhouse Style to be Replaced with Chinoiserie? ?